One of the things that I love most about our industry is the dynamic nature of the businesses we work with and the markets we operate within. The Oil & Gas market is no exception as witnessed at the ADIPEC exhibition last week in Abu Dhabi, UAE. ADIPEC was all that was promised—the event drew an estimated crowd of over 60,000 attendees and 1,800 exhibitors, and over 60+ country pavilions were present from around the world, suggesting the UAE continues to be rich with investment opportunity and growing significantly. 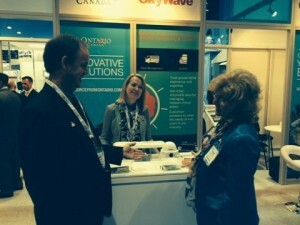 And SkyWave was well positioned in the midst of it all. The many visitor conversations at our booth focused on the need for reliable mobile communication solutions and workforce automation processes. For installations where technologies like RFID are deployed, those services quite clearly are not providing the reliability and scalability organizations need and companies are actively seeking out alternatives. No longer a matter of providing “just good enough” communication, companies are now in search of reliable data communication links that provide greater visibility into business operations. Among the many takeaways at ADIPEC is that SkyWave knows satellite and satellite-cellular data communications products and services better than anyone else in the industry. It’s core to our being. We are also well positioned with a respected channel partner distribution network that together makes us the right providers for this industry. In an ultra-connected world, data communications delivered via satellite becomes the business calling card, revealing organizations’ ability to access real-time remote information with the reliability of service and support businesses demand.